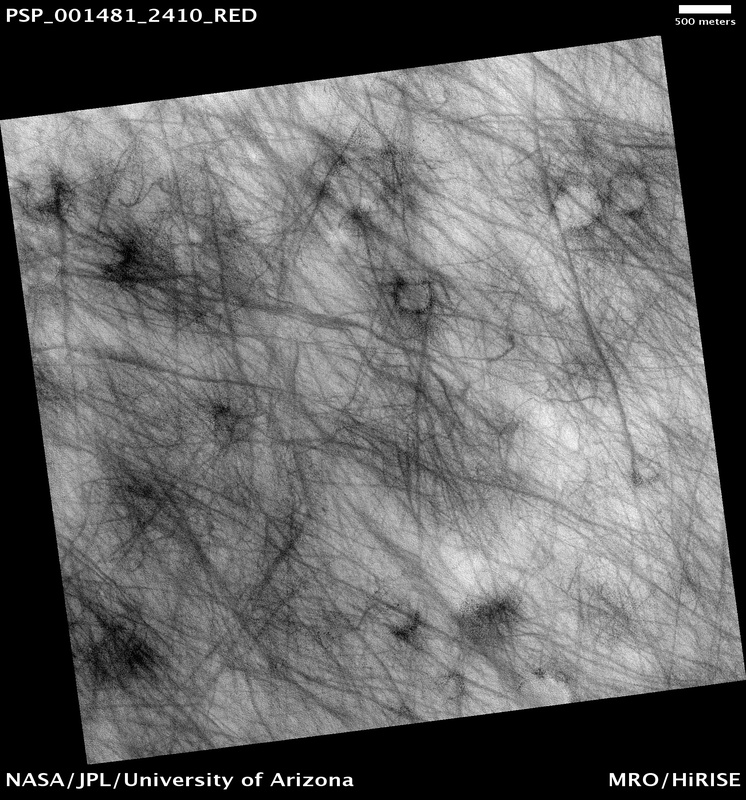 This observation shows a region of approximately 7 x 7 kilometer (4.4 x 4.4 miles) located in Vastitas Borealis, part of the Northern Plains. 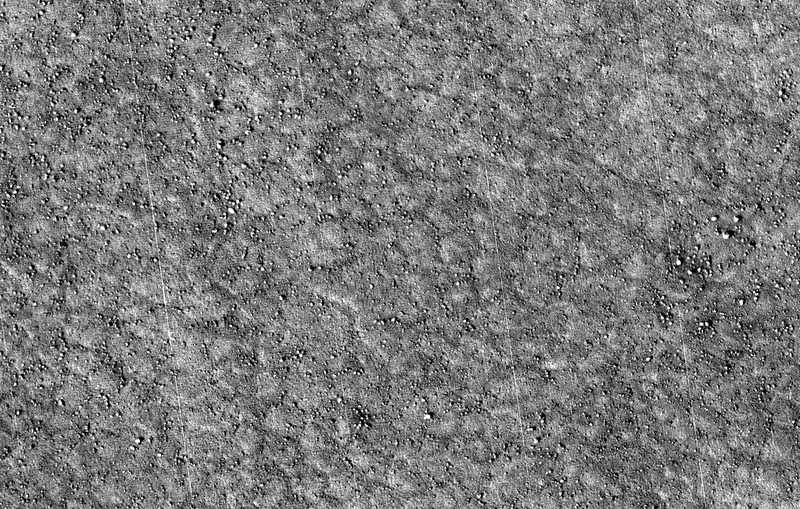 The surface imaged is relatively young, as indicated by the lack of recent impact craters. 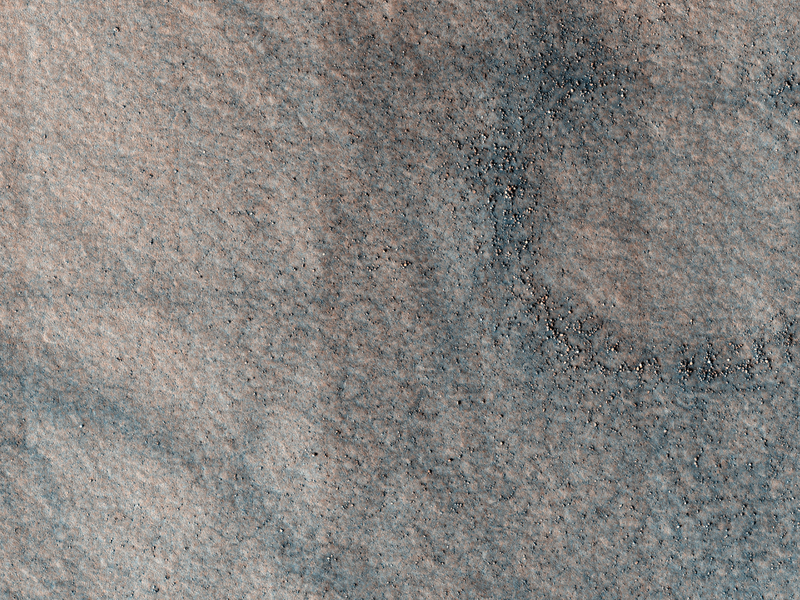 Aeolian and periglacial activity seem to be the dominant geological processes at work, as shown by numerous crisscrossing dust devil tracks and ubiquitous polygonal features, respectively. Dust devils form when the sun warms up the air near a flat, dry surface. Warm air then rises quickly through the cooler air above and starts spinning, causing a forward motion. 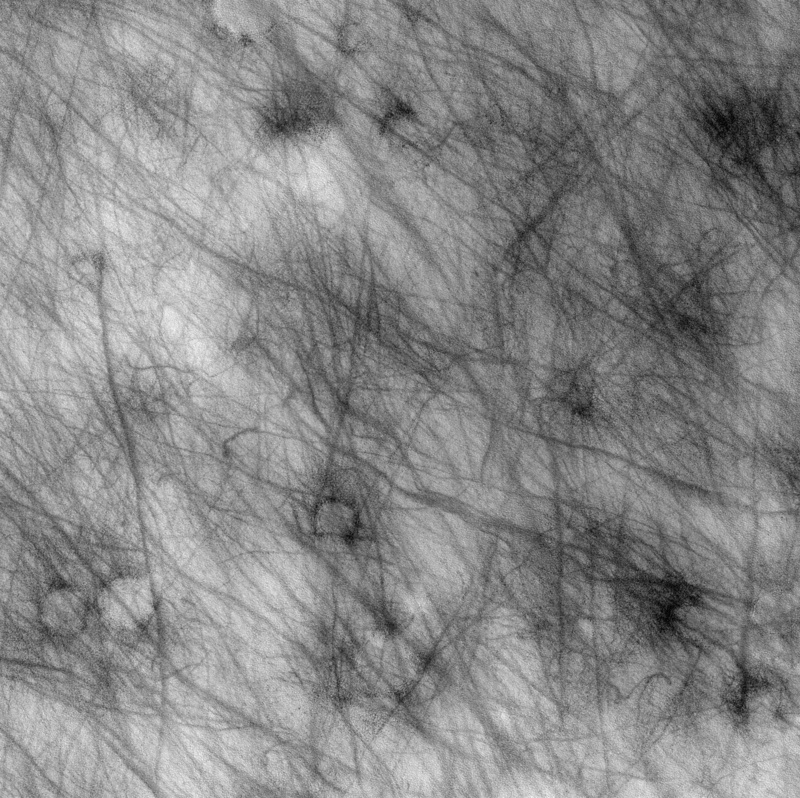 The spinning, forward-moving cell may pick up dust and sand as it advances, thus leaving behind a "clean" track. 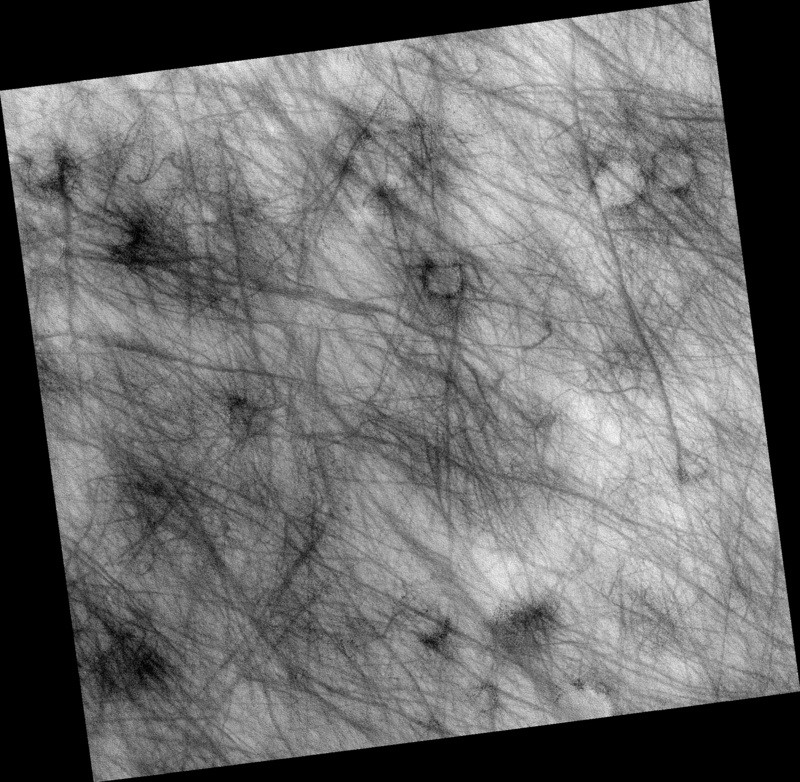 We infer from this image that a thin veneer of light-colored particles of dust and/or fine-grained sand cover relatively darker materials, apparent in the dust devil tracks. 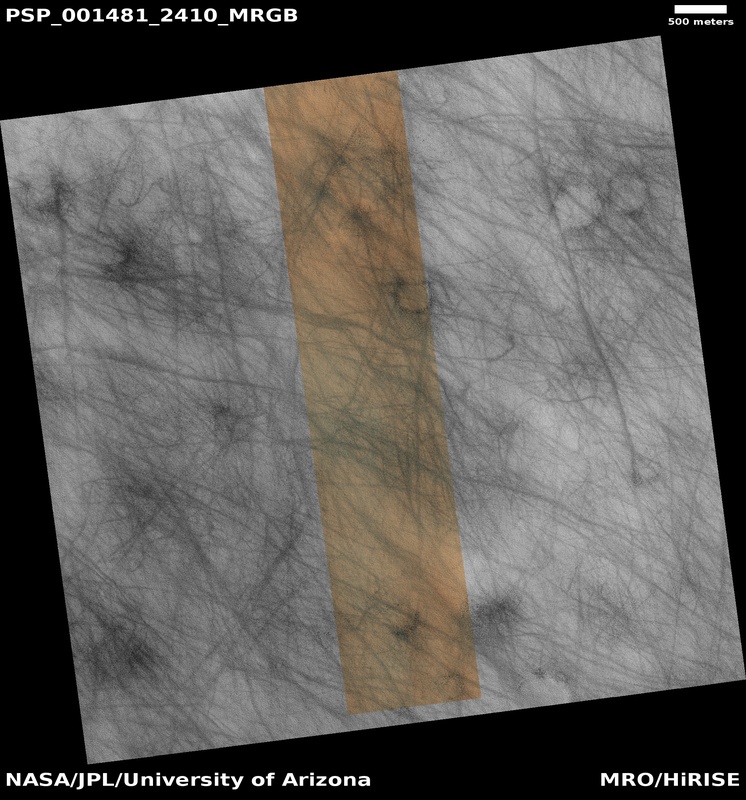 The tracks pictured in this image are in many cases more than 30 meters (27 yards) wide and over 4 kilometers (2.5 miles) long, surpassing the dimensions of average terrestrial dust devil tracks. The polygons visible in the subimage, which covers approximately 400 x 250 meters (350 x 225 yards), are in the order of 10 meters (0.9 yards) across; in some cases they are delimited by aligned rocks. Similar features in both shape and scale are found in terrestrial periglacial regions such as Antarctica, where ice is present at or near the surface. Antarctica's polygons and rock alignments are produced by repeated expansion and contraction of the soil-ice mixture due to seasonal temperature oscillations; dry soil falling into the cracks form sand wedges and amplify this effect. This results in polygonal networks of stress fractures and in the resurfacing and sorting of rocks along these fractures. (Thin diagonal lines are artifacts in the image).